Master bedroom with terrace, double bed and en suite bathroom. Another bedroom with two beds and bathroom in the hall. Fully equipped kitchen except dishwasher. Living- dining room with terrace. The building with 16 houses, has a garden and communal pool. In the area you will find El Corte Ingles, cinemas, bars, restaurants, newspapers, supermarkets, pharmacy, hairdressers and a 4 star hotel with Casino. In the surrounding area on Saturday mornings there is a flea market. Well located for golf lovers (we are in the Golf Valley) and the beach (Costa del Sol and Tarifa 1 hour). The center of Marbella and the old town can be reached in 10 minutes by car. You can also make cultural excursions during the day to the different Andalusian cities of Seville, Cordoba, Granada, Jerez and Malaga with the Carmen Thiessen and Picasso museums. Gibraltar 45 minutes and Africa from Tarifa 45 minutes. We enjoyed our stay very much. The apartment was very well equipped. It was also very tastefully furnished. The location was good. There is a taxi rank across the road. Also, we could get the bus to Marbella from the bus stop beside the casino. It is low season, so the local hotel, many shops and pubs were closed. However, if you value a quiet location, it is ideal. We can confidently recommend the property. Apartment located next to the Casino and under pass subway to the beach and harbour. Apartment was comfortable with 2 bedrooms and 2 bathrooms, had a nice outside terrace to sit and relax. Only complaint is that if renting out the apartment to British people than there should be some English tv channels, apart from that a very relaxed comfortable apartment close to all the amenities and a very helpful owner ready to answer any queries via text. Thank you for your comments and we are glad you enjoyed your stay. We should have mentioned that there is a way to toggle languages on the TV so that you can see movies and series in their original language, and there is much english-language content available. We will be sure to inform clients in the future. Stayed with my son for 4 days. Apartment clean and good size. Conveniently located for Puerto Banus so walked everywhere. Pool quiet and relaxing. Owner Charo very helpful too. Would go again. Sehr schönes Appartement, liebevoll eingerichtet. Alles top! Gute Lage in der Nähe von Puerto Banus. Sehr netter Kontakt vor Ort mit der Vermieterin. Thank you for your kind words, we hope you can come stay with us again some day. Thank you for your kind comment and for being our guest, we are very pleased you enjoyed your stay and hope you will stay with us again in the future if you are in Marbella again. Apartment fully equipped in building with garden and pool, internet, located at the mouth of the golf valley, 5 minutes walk from the beach and Puerto Banus. Shopping centers, bars, shops, restaurants, supermarkets, pharmacy and cinema around, next to bus stop and taxi. Old town center 10 minutes away by car. Apartment is fully equiped, tastefully decorated, five minutes walking to Puero Banus and the beach, includes internet, easy parking, two balconies. 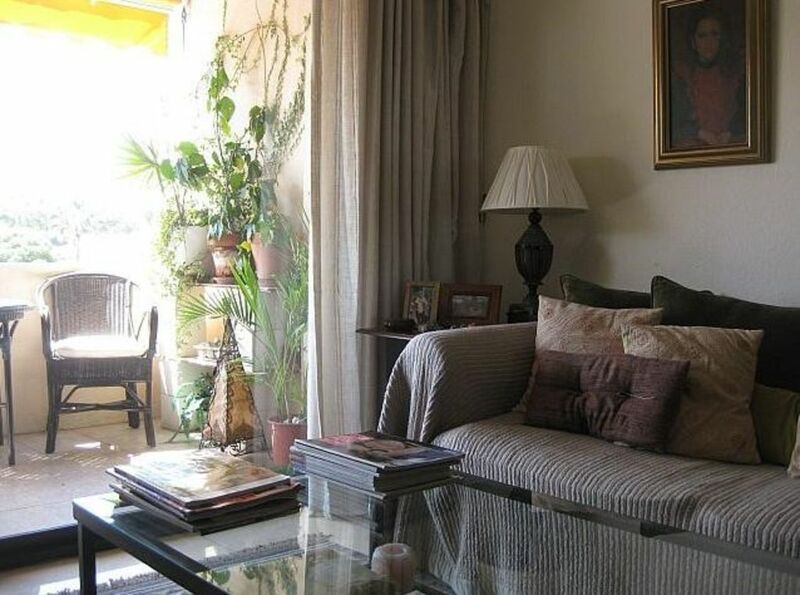 Close to shopping, supermarkets, restaurants, cinema and pharmacies.